In July 2018, I traveled to China for two weeks with the support of a Luce Initiative on Asian Studies and the Environment (LIASE) course development grant. I spent most of my time in Beijing, where I visited three museums: the Paleozoological Museum of China, the Beijing Museum of Natural History, and the Geological Museum of China. The Paleozoological Museum was the smallest in scale but most comprehensive in its fossil exhibitions because of its connections to the Institute of Vertebrate Paleontology and Paleoanthropology at the Chinese Academy of Sciences. 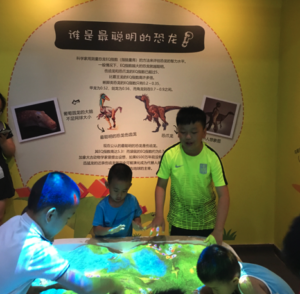 The Beijing Natural History Museum was impressive in scale, and embraced more of a popular ‘edutainment’ style in its exhibitions, with an entire floor devoted to animatronic dinosaurs that were a great hit with children. On the main floor, visitors can interact with dynamic reconstructions of dinosaurs, along with the more traditional restorations of re-assembled fossil bones. The exhibits at the Geological Museum of China, on the other hand, were smaller than I expected, with the majority of the floors being devoted to rocks, minerals, and gems. What was most interesting at this museum was an exhibit based on the 2016 centennial celebration of the institution’s founding, where beautiful inked renditions of China’s most renowned dinosaur species featured prominently. In Beijing, I also spent several days at the Institute of Vertebrate Paleontology and Paleoanthropology (IVPP). There, I met with Xu Xing, recognized as one of China’s leading paleontologists, who has discovered more species than anyone else (living) in the world. Xu Xing is at the forefront of the ‘dinosaur boom’ that has exploded in China over the past two decades, and his discoveries have revolutionized understandings in the field of vertebrate paleontology. I was also lucky enough to spend a day with Miman Zhang, a world-renowned paleontologist who recently received the International UNESCO Award for Women in Science, in recognition of her outstanding achievements in the field. Dr. Zhang’s accounts provided a fascinating portrait of the development of paleontology as an academic discipline in China, disruptions during the Cultural Revolution, and more recent collaborations between Chinese versus North American and European scientists. Finally, I met with Jingmai O’Connor, a paleontologist who received her PhD at the University of Southern California, and who has been based at the IVPP for the past nine years. In between shooting footage with a PBS film crew, Jingmai shared her invaluable insights into the significance of the fossil record in China, along with her comparative perspectives on paleontology in both countries. During my trip, I also traveled to Shenyang in the northeastern province of Liaoning, the site of China’s many famed feathered species (e.g. Anchiornis, Sinosauropteryx, Microraptor, etc.). 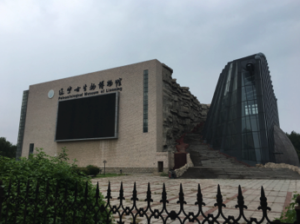 I visited the Paleontological Museum of Liaoning, which turned out to be closed until October for major renovations (this temporary closure was not advertised on the museum’s website, and I saw other visitors on the same day who were similarly disappointed). At Shenyang Normal University, I met with Hu Dongyu, a paleontologist well known for his work on the evolutionary links between dinosaurs and modern birds. Dr. Hu serves as a consultant for the Paleontological Museum of Liaoning, and was kind enough to arrange a private tour of the museum for me. The exhibits there were notable for their use of interactive, eye-catching display technologies as well as an unusual emphasis on paleoflora. Although in my original proposal, I had planned to travel to two cities in Liaoning, I decided against visiting Dalian because I discovered that the fossil exhibits at the Dalian Natural History Museum were relatively small in scale. My time in Beijing and Shenyang, however, provided a wealth of material that will be incorporated into my Modern Dinosaur class this semester. We will devote several sessions to exploring China’s ‘dinosaur boom,’ the scientific implications of its major discoveries, as well as the emergent role of dinosaurs in the country’s taxonomic nationalism. We will read, for example, an essay (in translation) written by Xu Xing for the national elementary school curriculum—read by all fourth graders in the country—on the significance of dinosaurs in China. This points to an active remaking of national consciousness based on the idea of paleoflora and fauna as natural heritage. Finally, we will consider the imperial aspects of expeditions undertaken in China by Western paleontologists such as Roy Chapman Andrews in the early 20th century, as well as inequalities established between scientific modes of knowing versus local indigenous perspectives. I am grateful to the Luce Foundation’s Initiative on Asian Studies and Environment for its generous support in funding this trip, thus allowing me to expand the scope of the Modern Dinosaur course to include a focus on China.